Duck Bill Lead Ball Bags in a Flat Bottom or Round Bottom Design. Our lead ball bags are duck bill lead ball bags. These duck bill lead ball bags are hand-stitched with flax thread. 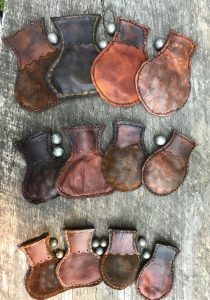 These duck bill lead ball bags have a squeeze type opening made with a thicker leather at the top of the lead ball bags. We have these duck bill ball bags in a round bottom style or in a flat bottom style. The duck billed lead ball bags are antiqued. We have both styles in three sizes of the lead ball bags made with vegetable tanned leather or goat skin. The different coloring is due to the different kinds of leather, and the antiquing method that we use in hand making our lead ball bags. The sizes for the round bottom lead ball bags is 4 1/2 inches long, the medium one is 3 5/8 inches long and the smallest is 3 inches long. The sizes for the flat bottom are as follows: large:4 1/2 inches long; med: 3 3/4 inches long; and the small is 3 1/4 inches long. The lead balls are not included.